1 of your 5 a day. Great for supper or brunch. Preheat the oven to 200°C, gas mark 6. Cook the spinach in boiling water for 1 minute, drain and refresh under cold water. Squeeze out all the water with your hands and chop finely. Heat the butter in a small pan, add the flour and cook for 1 minute. Off the heat, stir in the milk a little at a time, then bring to the boil and stir until thick and smooth. Stir the chopped spinach into the sauce and add nutmeg and seasoning. 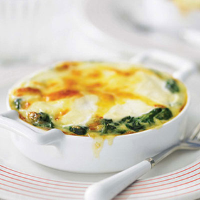 Spoon into the base of 2 large ramekins (250ml ramekins or larger) or shallow gratin dishes. Make shallow wells in the spinach, then break 2 eggs into each. Spoon over the crème fraîche and scatter with the grated Cheddar if using. Place in a roasting tin filled with hot water and bake in the oven for 12–15 minutes until the eggs are set. Serve with crusty bread. Add cubes of quickly cooked pancetta or chorizo to the spinach for a meaty version of this dish. The creaminess here suits a Chardonnay, but the nutmeg lends itself to something that’s refreshing, but not too dry. This Australian white from our Virtue range is absolutely perfect: Virtue Chardonnay/Colombard, S Australia.